With its sculptural quality, the Nero Large Table Lamp exudes a versatile style that is both artisanal and modern. This table lamp features a ceramic base with either a Matte Black or Matte White finish paired with a Linen shade. The Armato table lamp channels Kelly’s trademark affinity for clever mixology and natural materiality. 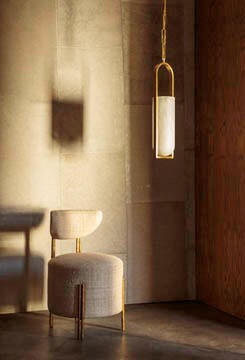 Graceful yet edgy, its subtle refinement and soulful sense of cool adds spirit and dimension to any space.